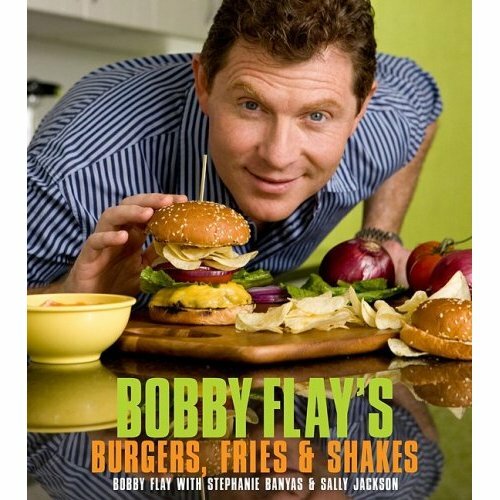 This is Bobby Flay’s recipe from his book Burgers, Shakes & Fries. It is a really good book for anybody who loves burgers. You should get one for Christmas, or Hanukah, or Festivus, or Chrismukkah. Everybody who likes burgers should buy this book! This is the burger that Mom had when we visited Bobby’s Burger Palace. She really liked it. I am not really a fan of avocados but I would like to try making the avocado relish because it sounds like fun. Bobby’s burgers are good basic recipe. You use good quality beef and you make them by hand. He makes 6 ounce burgers, but you could make 8 ounce burgers if you want them to be a little bit bigger. To make the avocado relish, combine the avocados, onion, jalapeno, lime juice, and cilantro in a small bowl and season with salt and pepper. The relish can be made up to 1 hour in advance and kept at room temperature.